We tried this recipe last weekend, and to my surprise, I got two-thumbs up from my family…two-thumbs way up from my husband. It’s not that he’s super picky, it’s just that after 10 years of being married, he’s used to what we often have around and new recipes are met with a skeptical eye. Actually, I was surprised by its good taste as well. It hits all requirements on my checklist for a “keeper recipe”. 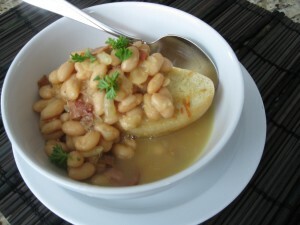 Cheap, common ingredients (check), easily prepared (check) and everyone likes it (check). So from me to you; enjoy! 1 sprig fresh rosemary (optional-I didn’t have this when I cooked it the first time, but I’m sure it would add more deliciousness). 1. Heat the oil (I use canola) in a skillet. 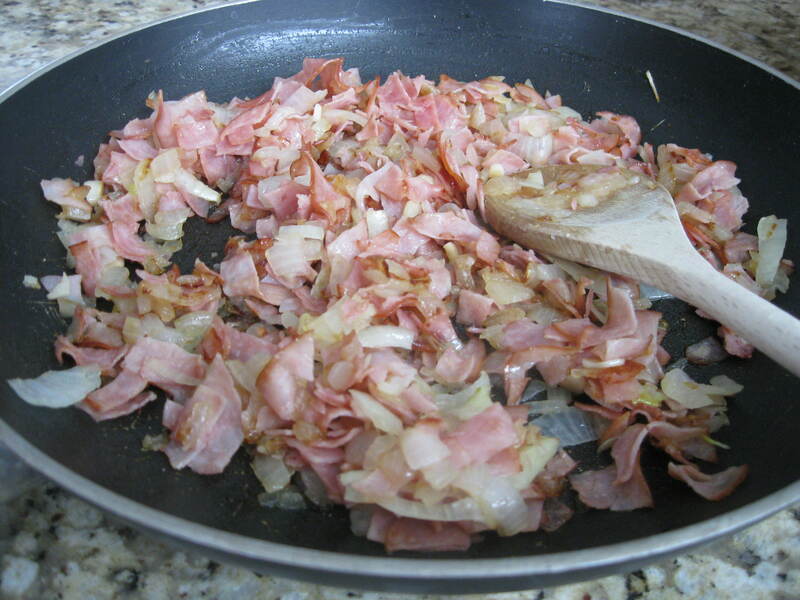 Add the ham, onions, and garlic. Cook until everything is heavily browned. 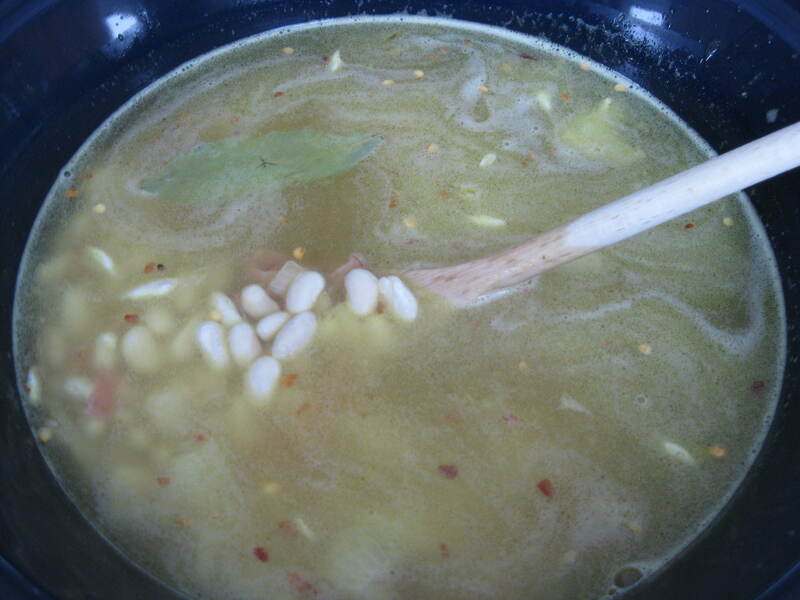 Transfer the ham and onion mixture to the slow cooker and stir in the broth, water, beans (they will be swollen but still hard after soaking them), bay leaves, and pepper flakes. Cover and cook on high for 8-9 hours. (This is a shot of what it looked like when it was all dumped together, but not cooked). After the beans are soft, add the rosemary sprig and leave in the soup for 15 minutes. Remove it, and the bay leaves. 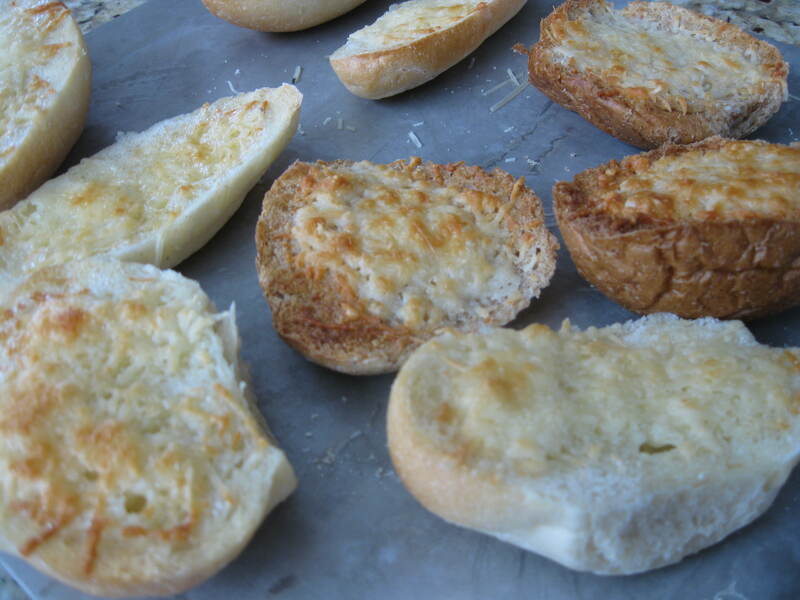 In the meantime, butter whatever your bread of choice is, sprinkle with parmesan cheese, and broil in the oven until the bread is browned and crispy. When everything is done, salt and pepper to taste, place a piece of bread at the bottom of your bowls, and ladle the soup over the top. Sprinkle with fresh parsley and parmesan cheese.